Fill your wardrobe with these lovely Fall dresses in 1950. Use the Fall Costume Color Family swatches to help you match, blend and contrast. 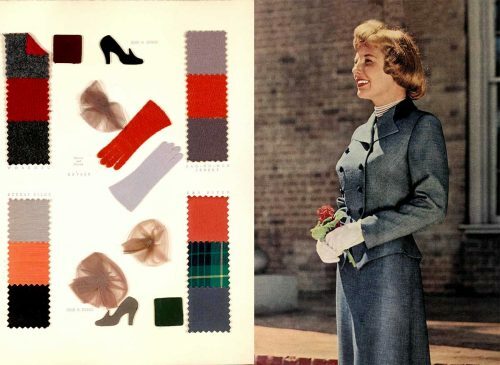 Costume Color families for Fall 1950 is presented by the Costume Color Council. The colors are displayed in such a way that within each color family you can work out your own combination of color tones for coat, suit, blouse, dress, bag, shoes, hosiery and gloves. An iconic photograph from October issue of Vogue in 1950. Model Dorothy Horan wears a Pacific worsted gabardine suit by Harry Frechtel. Glazed plush bicorne hat by Lilly Dache. Lipstick by Prince Matchabelli. Reds are real reds this Fall, ranging from true scarlet to glowing cherry. To contrast, try brown. For sharp contrast try blacks or whites. June Allyson wears an original grey Fall suit by costume designer Helen Rose. Jaunty cut-away front, velvet collar. Slim skirt has a slight flare at the hem. Use the color swatch to match, blend and contrast. Oxford and Charcoal are the key colors to start your Fall costume this year. Liz Scott in an original grey Fall suit by costume designer Michael Woulfe. A fashion first in grey flannel, its tailored trimness is accented by high, tiny collar. Interesting side pockets and slim skirt. Use the color swatch to add other tones to contrast. Viveca Linfors models this Edith Head creation in light plum tones. For a plum suit or dress, Royal blue and yellow are good alternates as vivid contrast. Browns this season, range from earthy to pale beige. Youthful all-wool tweed suit worn by Marion Marshall. In earth brown with russet, the skirt has a new flare. Designed by Jeanne Barrie. 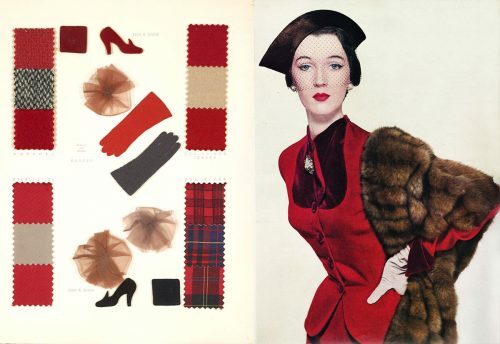 The Costume Color Council Book for Fall 1950 is courtesy of the Smithsonian Library.